This is on my sewing table at the moment. 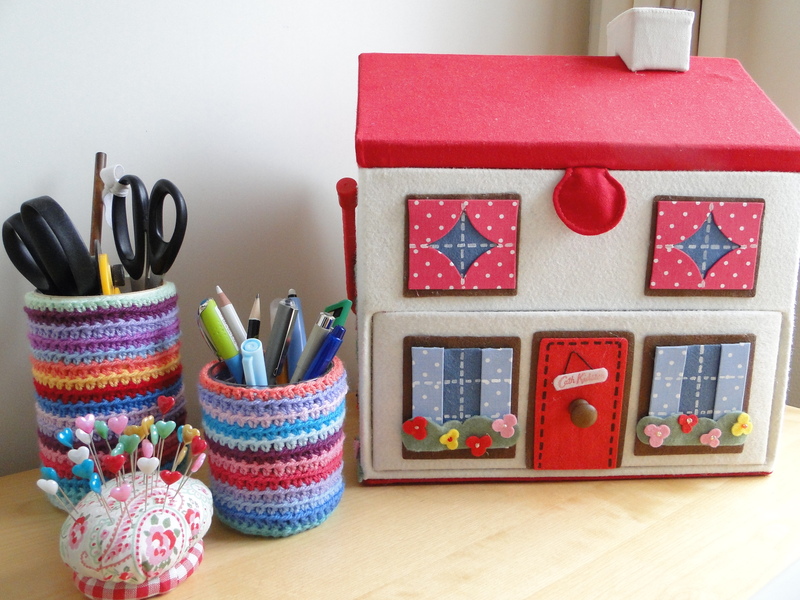 The house sewing box is from Cath Kidston. The crocheted jam jar cozies are inspired by the talented Lucy at Attic 24. And finally the pin cushion was made by me! It certainly brightens my day. Queensland Australia is being battered and washed away by terrible floods. We have been lucky enough to visit Australia 3 times and have loved every visit, it is a wonderful country of extremes, and this is such a tragedy. Toni is organizing Flood Relief Auctions and I’m going to host one here on my blog. 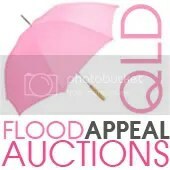 Stay tuned later this week for more details – I am going to auction off some handmade goodies with all proceeds going to the Queensland Government Flood Relief Appeal. I had promised my daughter for a while that I would put a drawing table in the play room, she loves to draw and easily gets bored watching TV (unlike my son who has square eyes). So at the weekend when we popped to the local garden centre for a browse and I stumbled upon some spotty oilcloth, I had an idea. The Ikea toddler table could have a face lift and become the much needed place to sit and draw. I cut the oilcloth a couple of inches bigger than the top and stapled it underneath with a staple gun. If you have a bigger table, that you want to look especially nice, Chez Larsson shows you how here. It looks great, is easily wipeable, and most of all is now in daily use. I wouldnt like to tell you just how long this took, because it would be embarrassing. But hey it’s done now. I just need to get my gorgeous husband to get it hung up on the wall. I hope you had a lovely Valentines day. I would show you the cake that my lovely family purchased it was a chocolate loaf cake with a chocolate ganache on top with red marzipan hearts on, however we ate it rather too quickly. And I forgot to get the camera out…oops. Never mind it was delicious. Many of you will have seen the devastation in Victoria, Australia over the past few days. 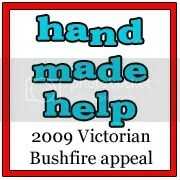 There are many ways YOU can help our friends down under. So many have lost everything. Donations of money are required to get immediate help to those affected and then for the longer term there are other ways we can help. Please click the link above to see what you could do. My son has his first wobbly tooth at last and he is delighted. So what’s a crafting Mum to do to make him feel that this is a special event? Make a cute hanging pillow to keep the precious tooth safe until the tooth fairy comes and swaps it for some money, of course! I used some fabric scraps and a piece of felt. Sewed them together with a little pocket and viola! Hopefully we won’t have to wait too long until the tooth comes out so it can be used.